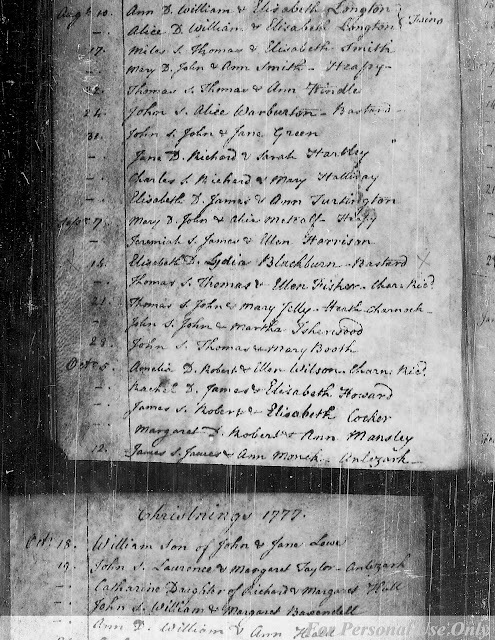 Parish registers for St. Laurence's Church, Chorley [Lancashire], 1653-1947, Family History Library, Salt Lake City, Utah (on 10 FHL Microfilm reels), original records at Lancashire Record Office, Preston, Births, baptisms, marriages, burials, 1653-1821 on FHL BRITISH Film . Baptisms, 1777, Margaret Mansley entry. Margaret Mansley was the 5th child of at least 7 born to Robert and Ann (Higginson) Mansley in Chorley, Lancashire. She married Alexander Whittle (1774-1855) in 1797 in Chorley, Lancashire, and they had 12 children between 1798 and 1823. Their son, Alexander Whittle (1818-1853) married Rachel Morley (1821-1861) in 1840 in Bolton-le-Moors, Lancashire.